Hi everyone! Thank you for allowing me to have a week off last week. I just had a really crazy time getting settled into work and the new place and I’ve just been feeling a bit off. I am excited thought to start Apartment Tuesday (the lamest of all names; I know, but at least it is a start) starting tomorrow, assuming the internet doesn’t stop working again :P. I am also going to be doing a couple of fitness posts scattered here and there. I did get a request to review my Fitbit, so I will definitely be doing that soon. But anyway, today’s post is a beauty post, a shampoo in fact. I don’t know why but it feels like I haven’t really been trying anything new with my shampoo lately. I had found a bunch of them in my college stuff shortly before moving out for the year and just decided to finish those. 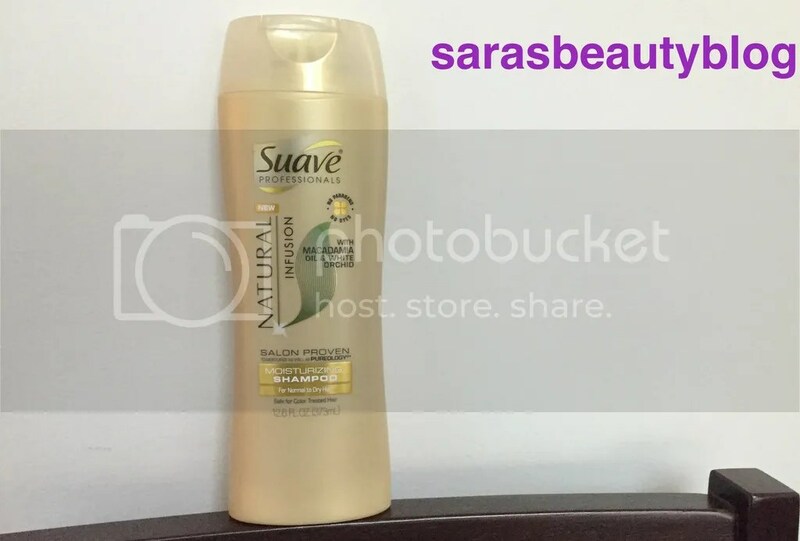 However, I did end up purchasing this one: Suave Natural Infusions Moisturizing Shampoo. It came as a recommendation from my mom. I told her I wanted a moisturizing shampoo and she told me that she had really been liking the shampoos she had tried from this new(er) Suave range. She had never given this particular one a try, but I decided that her love of the line was good enough to warrant my purchase of it. One of the biggest selling points for this product was the smell. The front of the package claims that it is made with “Macadamia Oil and White Orchid.” I don’t really know what either of those smells like, but I will say that it smells delicious. It isn’t overly floral or nutty or fruity or sweet, but it has notes in all of those categories. Together, they blend together in a really unique and addicting aroma. Amazing smell aside, the shampoo was average for me. It didn’t wow me in terms of its moisturizing qualities but it definitely didn’t dry out my hair. I didn’t get the strange, “squeaky clean” feeling that I had experienced with other shampoos, but my hair still felt clean after washing. It didn’t weigh my hair down at all, either, which is a huge plus. Another thing to note is that it did not cause my hair to produce more dandruff (some shampoos can cause my scalp to be really itchy and even flakey; this did neither). I really can’t think of anything bad to say about this product- it just didn’t wow me. I think that because I do so much reviewing for this site, I have experienced some really great high-end and affordable shampoos, and, because of that, I have fairly high expectations for my hair products. This one was average, and given the exceptionally good price point, I would recommend it to anyone looking for your standard, run-of-the-mill, delicious-smelling shampoo. Is it the best that you can get in the drugstore? No. But it is really nice and I could easily see myself purchasing this again sometime in the future. I bought this product myself. All opinions are my own. I’m not getting paid for this post. This entry was posted in Uncategorized and tagged affordable, drugstore, macadamia oil, moisturizing, natural infusions, photo, photos, review, reviews, shampoo, suave, suave professionals, white orchid. Bookmark the permalink.